Fulford Manufacturing Company, is a metal working company with well over 100 years experience. 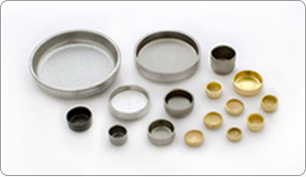 Our company is uniquely divided into two business sectors - Automotive/OEM Products and Emblematic Products. 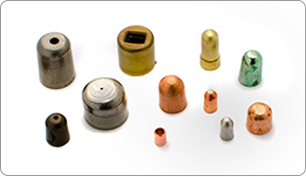 We specialize in miniature automotive stampings and assemblies such as cup plugs, check ball valves, orifice plugs, freeze plugs and spring pins. The images below are a small sampling of our products. They are not shown in a standard scale. 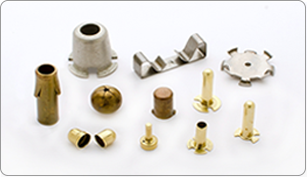 Many of our automotive products and capabilities are suitable for OEM applications such as medical device components, hydraulic/pneumatic plugs and flow restrictors, electronic components, standard eyelets and grommets. Fulford's emblematic business sector is known world-wide as Gold 'N' Things. If you would like to obtain a quote, view our selection of awareness ribbon pins, review our custom jewelry capabilities or contact our personnel for information, please jump to our Gold 'N' Things site. 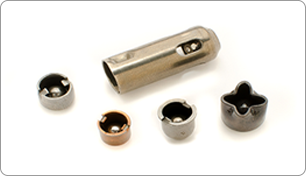 Fulford Manufacturing was founded in 1891.
electronic, medical device and emblematic industries. All Original Content Copyright Fulford Manufacturing Co., Inc., All Rights Reserved.